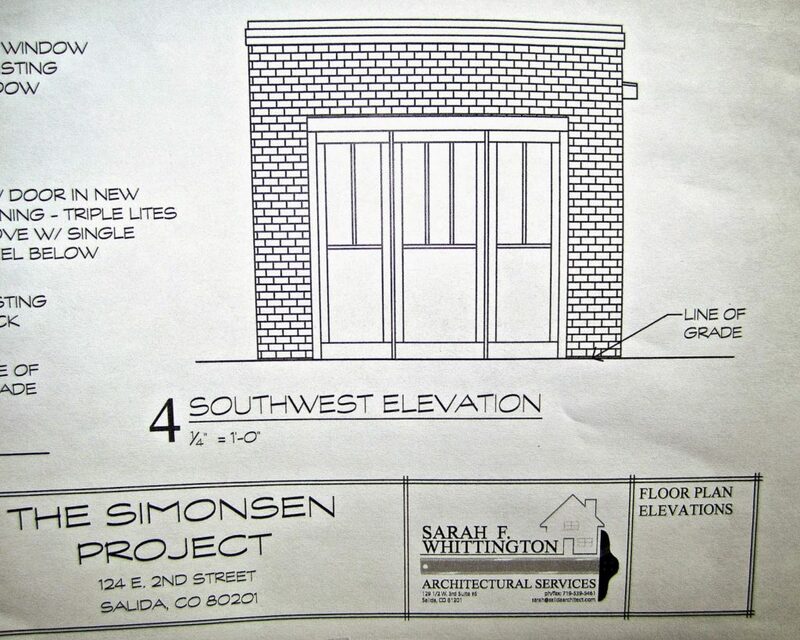 Seventeen months ago, I signed the deed to 124 East 2nd Street in Salida, Colorado (see 20 March 2013 post). 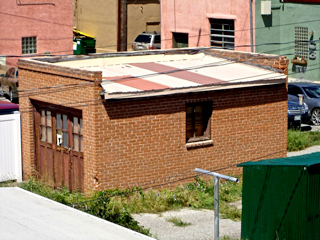 Located in the town’s historic district, the property I purchased includes a main building dating to sometime between 1888 and 1890, and an accessory building of unknown age heretofore referred to as the Annex. Suffering the effects of time and neglect, the preservation and transformation of these two buildings into enduring functional spaces promised to require considerable effort and resources. In other words, the signing on 20 March 2013 marked the first of many turning points; it marked the onset of many delays. Initially, I focused on the main building. While I waited for my contractor to replace a long-lost downspout and a leaking skylight and to jack up a sunken corner of flooring—for starters—I removed river rock and other rubble from the shallow crawl space, I cut back crumbling mortar and re-plastered the face of interior low-fired clay-brick walls, I tore off construction-grade plywood jambs and casings that had been standing in for original woodwork that had been removed during an earlier “renovation,” and I drew up plans for the electrical work. 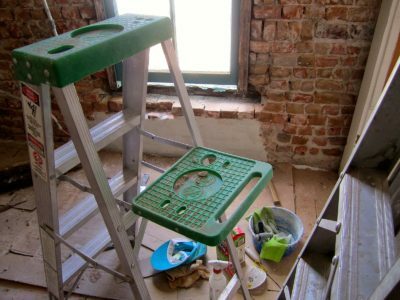 When the philosophy I learned from my mother—if it’s worth doing, it’s worth doing well—collided with my contractor’s “lick and stick” approach, he and I parted ways, but not before he pointed me in the direction of an architect who is well versed in codes and compliance. Soon after connecting with my architect, I realized that it made more sense to restore and enlarge the accessory building before finishing the main building. Challenged by all the things that code did not permit, my architect and I worked together in fits and starts through the winter. Come late July 2014, just when we thought we were finally ready to submit our plans for the Annex to the Historic Preservation Committee (HPC) for approval, we lost a week toward determining whether we would need an official assessment of an existing window, dictating whether that window was replaceable or had to be restored. On 24 July we received word that the window assessment would not be required because the building itself is not a designated historic structure. And four days later, our plans were, at long last, submitted. We were then scheduled to defend our plans before the HPC four weeks out, but the date was ultimately postponed another week. Finally, we appeared before the Board on 28 August. Our plan was accepted with one minor contingency that we quickly addressed. And I toasted the milestone with a glass of Malbec. Are we home free? Can we begin work yet on the Annex? No, we need permits: general building, electrical, and mechanical. Once our drawings are complete, processing our applications could take as long as 4 weeks. And once the permits are issued, there will be other delays—inclement weather, builders not available, building materials out of stock, inspections postponed. In other words, the completion date for the renovation and expansion of the Annex is best not to estimate. In other words still, what I learned restoring a roofless house in Greece stone by stone by hand over many years will serve me throughout the current Salida restoration project as well: Na paei makria, siga-siga; To travel far, travel slowly. It's very exciting to read about this project! Exciting indeed! And many life lessons. visual artist, writer, speaker/storyteller, independent travel guide in Greece, stonemason, host of Astra Writing in Greece for women writers who like to travel, workshop facilitator of Art of Intuition / Realm of Possibility.